The 9th Gen Intel Core desktop processors the first unlocked mainstream desktop processor. With up to 5GHz and 16-way multitasking, take your creativity to the next level with the power you need to create, edit, and share. See also Pentium GOLD, Core i3, Core i5 and Core i7 CPUs. Introducing the 9th Gen Intel Core desktop processors - the most powerful generation of Intel Core desktop processors. Whether you are a gamer looking for a fantastic in-game experience with the performance headroom for smooth live streaming and seamless highlights recording or you are a creator that is ready to do more creating and sharing, less time waiting, this new generation of processors is ready to take you to that new level. The 9th Gen Intel Core processor takes mainstream desktop PC performance to a whole new level. At the top of the stack, Intel's mainstream flagship, the new i9-9900K. 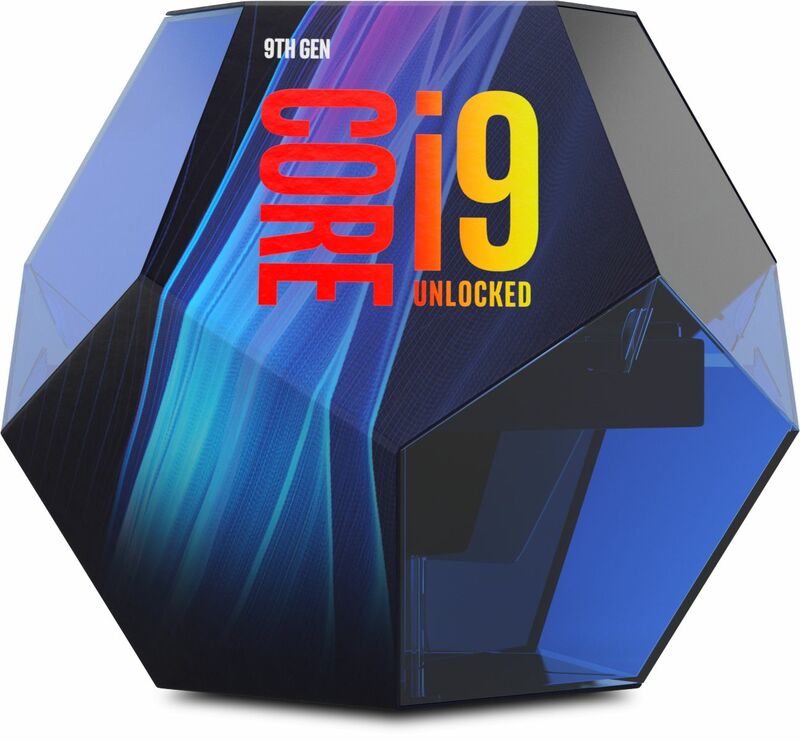 The first Intel Core i9 desktop processor for the mainstream users. Best in class, the i9-9900K with 16MB of cache1 and Intel Turbo Boost 2.0 technology cranks maximum turbo frequency up to blazing 5.0 GHz. Throw in high performing 16-way multitasking support powered by 8 cores with Intel Hyper-Threading Technology (Intel HT Technology) to conquer the most demanding workloads. Want to reach for even greater levels of performance? — Overclock confidently with new and enhanced features like Solder Thermal Interface Material (STIM) and improved overclocking customisations to tweak the processor performance to its unleashed potential. A range of processors including the first unlocked Intel Core i9 mainstream desktop processor. Data acceleration when paired with Intel Optane memory to retrieve that data you use the most for fast system responsiveness. DDR4 RAM memory technology support, which allows systems to have up to 64 GB of memory and up to 2666 MT/s memory transfer speeds. Intel Z390 chipset support which includes unprecedented connectivity to all of your devices with integrated USB 3.1 Gen 2, Intel Wireless-AC, and support for Gigabit Wi-Fi speed. Compatible with Intel 300 series chipset. Game, Record, Stream without compromise on a system powered by a 9th Generation Intel Core i9 processor. Utilise Intel Quick Sync Video technology to live-stream, capture, and multitask without interruption. Power up and customise your gaming rig with up to 40 platform PCIe* lanes giving you the outstanding flexibility. Pair it with Intel Optane™ memory technology to accelerate the loading and launching of the games you play the most. Unlock your creative potential with the power you need to create, edit, and share. Let your creativity flow as the 9th Generation Intel Core processor renders and encodes in the background so you don’t miss a beat. Minimise the wait time between inspiration and creation with Intel Optane memory accelerating the loading of your most used applications. Delivering smooth streaming of premium 4K UHD entertainment to your PC from leading online providers. Providing full-size, screen-immersive viewing experiences with 4K video and 360-degree viewing. High Dynamic Range (HDR) and Rec. 2020 (Wide Color Gamut) for life-like luminesces to provide enhanced image and video viewing experiences. Intel Software Guard Extensions (Intel SGX)1 to help applications protect your system and your data. Intel BIOS Guard and Intel Boot Guard to help protect your system during startup. A 9th Generation Intel Core processor is a great investment in your desktop experiences — whether for gaming, creating, entertainment, or general purpose computing - wherever your life takes you. From the bar-raising performance of the 9th Generation Intel Core i9-9900K processor with up to 5GHz and 16-way multitasking to great value entry-level performance options down the stack, Intel's latest generation of desktop processors offers a range of options for your budgets and needs. 9th Gen is the most powerful generation of Intel Core desktop processors, with features and enhancements to evoke excitement in what you love to do. Step up to a 9th Gen Intel Core processor-powered PC and experience the difference.